An iPad app helps first and second graders create and identify geometric shapes while developing higher-order thinking skills required by the Common Core math standards. As a former elementary school teacher in a 1:1 iPad classroom, I know how powerful iPads can be as learning tools in the hands of students. This mobile device is so much more than a content consumption tool, because students can use an iPad for hands-on learning. They can move items across the screen, write about a topic, and document their learning using audio and visual tools. I want to introduce you to a virtual manipulative app and demonstrate a few different ways that it can be used in an elementary school classroom to address concepts outlined in the Common Core State Standards while promoting higher-order thinking skills. 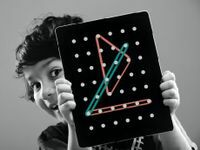 Geoboard, by the Math Learning Center is a versatile app that provides a rubber-band free alternative to traditional geoboards. It lets students pick and choose from two different boards and lots of virtual rubber bands to create shapes. CCSS.Math.Content.1.G.A.3: Partition circles and rectangles into two and four equal shares, describe the shares using the words "halves," "fourths," and "quarters," and use the phrases "half of," "fourth of," and "quarter of." Describe the whole as two of, or four of the shares. Understand for these examples that decomposing into more equal shares creates smaller shares. CCSS.Math.Content.2.G.A.1: Recognize and draw shapes having specified attributes, such as a given number of angles or a given number of equal faces. Identify triangles, quadrilaterals, pentagons, hexagons, and cubes. Students can use the virtual rubber bands on their iPad screen to draw shapes and divide them into equal pieces. In a first grade classroom, you might ask students to draw a rectangle and cut it into halves or fourths, using different colored rubber bands to show the dividing line. In a second grade classroom, you might ask students to draw and name different quadrilaterals, and then use given vocabulary terms in a partner discussion about what makes each polygon different. There are plenty of geometry tasks that students can complete with the help of Geoboard as they begin finding the area of polygons using unit squares, explore the relationship between perimeter and area, and discuss the attributes of different shapes. Although it's the lowest level of the SAMR model, I truly believe that substitution is underrated. Whether it engages your elementary schoolers or is used to introduce expectations and procedures, substitution has a natural place in the classroom. If it's the steppingstone that you need to start using technology with your students, go for it! That being said, there are plenty of ways to scale up this activity in your classroom and push students toward becoming content creators. One way to accomplish this goal is by using multiple apps in a lesson. For example, after having your students draw and partition shapes, have them take a screenshot of their work and save it to the Camera Roll of their iPad. Next, they can open up their screenshots in a poster-making app like Pic Collage and add text to the screen. This will help them show what they've learned about attributes of polygons in writing that includes academic vocabulary. Students can also use a screencasting app like Explain Everything to annotate their screenshots and record their voice to demonstrate their understanding. This is a great option if you have access to only a handful of iPads -- students can take turns recording their explanations as they work together on one device. These extension activities can be used to push higher-order thinking skills and address the CCSS Standards for Mathematical Practice, which expect students to increase their communication skills and conceptual understanding of a topic. In the comments below, share your favorite apps and activities for addressing the Common Core in your elementary math classroom.